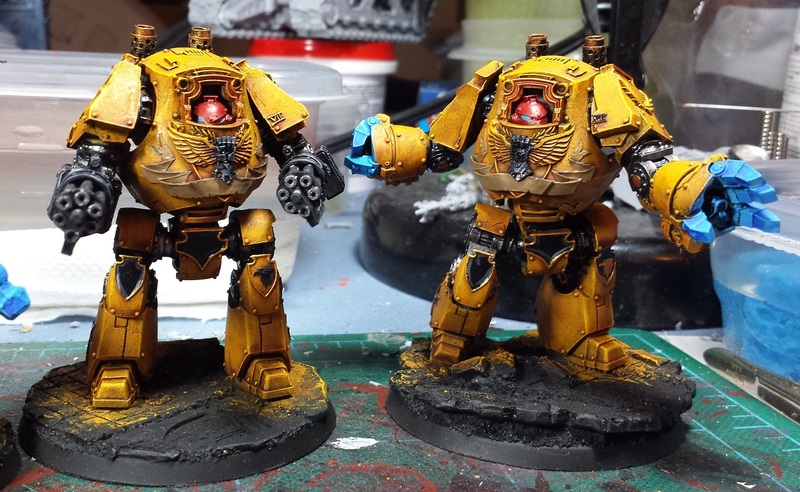 Following the paint scheme for the terminators found in Extermination, primarily yellow with a few black plates and a fair chunk of gold trim. I'm going with a reddish-gold to try and help it stand out from the yellow of the armour. So far so good! The Contemptors are getting painted at the same time as the Terminators, decided to go with the red veteran helmet colors (white stripes to come) as it seems logical that the marines interred in the Contemptor chassis would likely be veterans of the legion. Quite pleased with how they're coming along, still a ways to go of course! I managed to get the waterslide transfers and weathering on the assault squad and get them flocked and sealed, but need to wait for some good daylight to get the final pics of 'em - hope to do that over lunch today! Man, all this stuff looks better and better now it has colour slapped about! Those Contemptors are especially sexi. He'll always be "Nacho Libre" to me. And possibly to you too, now I've said it out loud. Looking forward to seeing him smash another contemptor over the head with a chair, clothes line him and then pile drive him off the ropes. I've always loved the Fists Veteran Helmet colour scheme, can't wait to see it on the Contemptors. @Dai: Thanks very much man! @Zzzzzz: Hah! I'm going to have to add that name subtly somewhere on him! @Dave Weston: Indeed - it's a great contrast color, expect to see that scattered throughout the army! Wow, they look fantastic. 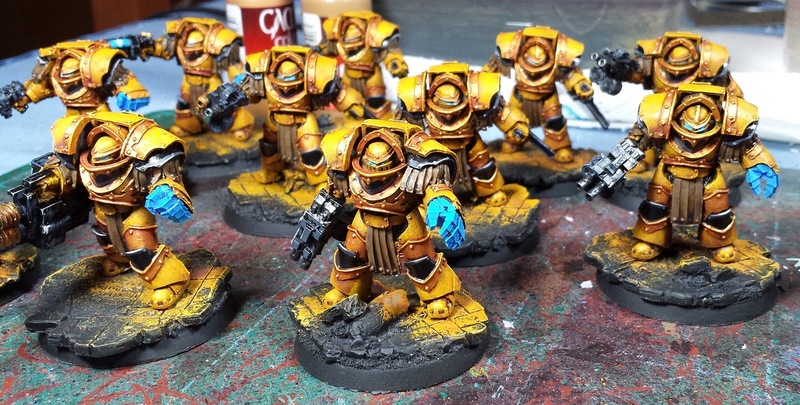 The deeper yellow on the comtemptors in particular really gives them a great presence.